1. Enter the data in the following cells: B2 = 96, C2 = 95, D2 = 97, B3 = 90, C3 = 98, D3 = 88, B4 = 86, C4 = 76, and D4 = 84. 2. Go to cell B5. To recall, you can go to a cell in any one of three ways: use the arrow keys, tap the cell, or use the (Go To) function on the soft key menu. 3. Press [ Shift ], [ . ] ( = ), [ Menu ], select 5 for AVERAGE, the parenthesis key [ ( ) ], and then enter B2:B4. You should have =AVERAGE(B2:B4). Press ( OK ). The result should be 90.667, the average for Belinda. 4. Copy and paste the formula from B5 to C5 to get the average for Chris. To copy the formula, press [ Shift ], [ View ] (Copy). 5. Move to cell C5. To paste, press [ Shift ], [ Menu ] (Paste). You will be presented by what is on the clipboard. You will want to select the last result 90.667. Note that there is a > next to it. Press the right key [ → ] and select Formula (not Value). The formula is copied on to cell C5, with the proper cells as its range. 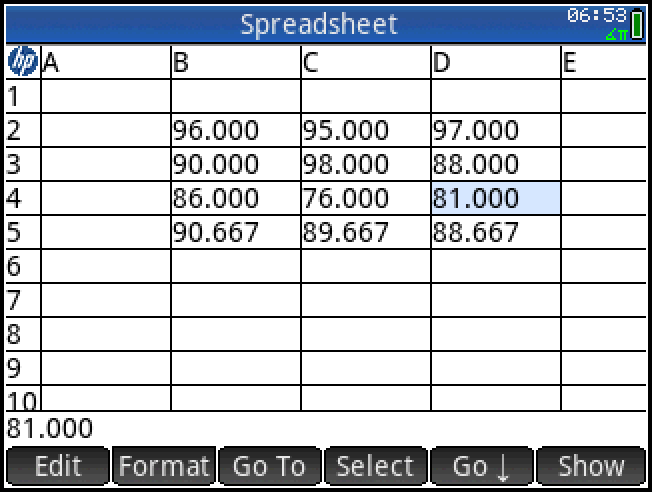 If it goes right, C5 contains 89.667. 6. Repeat the steps 4 and 5 for Drake, except you can copy the formula from either cell B5 or C5. Don’t forget when pasting, select the copied result, press the right key [ → ], and select Formula. Drake should have an average of 89.667. 7. The professor has just realized that score of Drake’s third quiz is incorrect (cell D4). It should be 81. Go to cell D4 and enter 81. Note that the average for Drake (cell D5) is automatically updated, and it is now 88.667. This concludes Lesson 2. 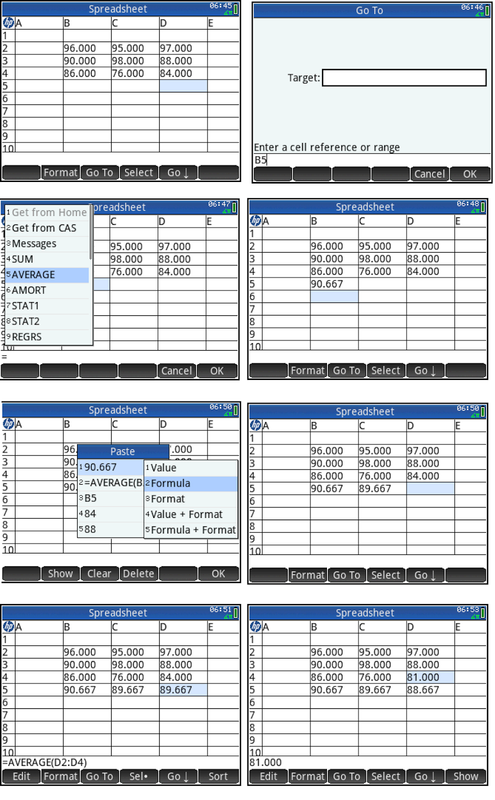 Next time, adding labels to cells and extending columns. 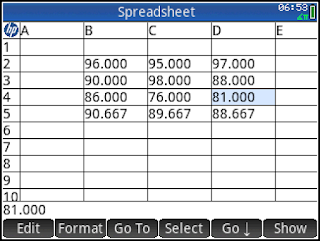 For a spreadsheet to be useful, you have to be able to insert and delete columns and rows, and add titles to the rows and columns. 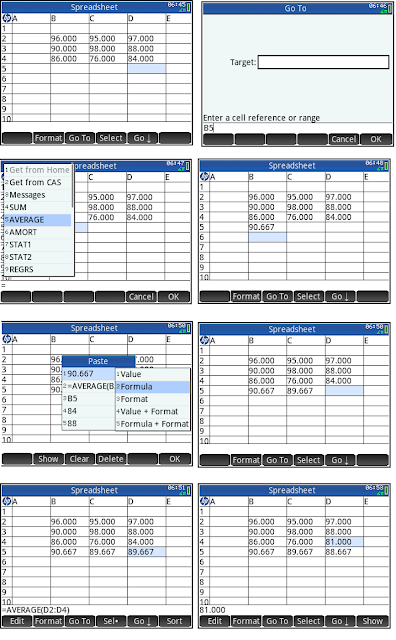 I realize this blog is rather old, but ratherthan creating different new spreadsheets we need a single larger project where we work with the data we've already got. Which brings up the question: How do you save a sheet?